Rana, 35, is all smiles. 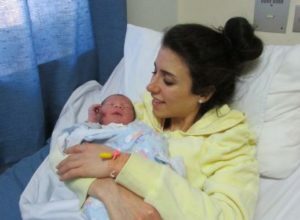 After having gone through quite a scare before the birth of her third daughter, the Bethlehem University graduate is now thrilled to watch her daughter, Lorianne, thriving in the Holy Family Hospital Neonatal Intensive Care Unit. She and her husband, Sami, 39, are a young Christian couple who live in Beit Jalla, a village neighboring Bethlehem. He works for a Palestinian NGO, and they have two other daughters, Laya, 9, and Larina, 4. The family was eagerly awaiting the birth of their new baby when all their hopes seemed to have come crashing down around them. During a normal checkup with her private doctor who works through Holy Family Hospital, a growth was detected on the baby’s umbilical cord during Rana’s 34th week of pregnancy. She was sent urgently to a medical specialist in the West Bank city of Ramallah. 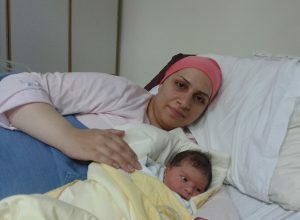 He determined that the baby was in danger and that Rana needed an emergency cesarean section in order to save her life. Four days later Rana was admitted to Holy Family Hospital where she delivered Lorianne on July 13th, weighing a mere 3.3 pounds at birth. Her due date was September 5th, said Rana. 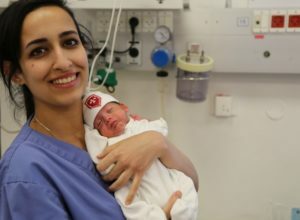 Head nursing supervisor for the Neonatal Intensive Care Unit Ishraf Faraj noted that though born prematurely, Lorianne was born in good health. “Now we are just waiting for her to gain weight. She is in good general condition,” said Faraj. Rana glowed as she cradled her tiny precious daughter in her arms. She cooed gently to Lorianne as she carefully arranged the tubes around her and settled the infant in the crook of her arm. This was the first week she has been allowed to hold her daughter, Rana said, and she has learned how to manage around all the medical equipment used to help her daughter get stronger. Now Lorianne must gain weight, to at least six pounds and her family is waiting anxiously for her to come home. In the meantime, Rana comes to the Hospital every day to visit her baby and divides her time between her older daughters and her baby. The family had planned on paying for the delivery by themselves, but the unexpected expense of the emergency cesarean section and Lorianne’s several-week stay at the Neonatal Intensive Care Unit is beyond their means. Though she was currently studying the case to see how long Lorianne would have to stay at the hospital, social worker Mary Maoh said that thanks to generous donations she would be able to help the young Christian couple with some percentage of their bill. “I can’t wait to take Lorianne home. Her sisters haven’t seen her yet, and they want to see her,” said Rana.